The original 1996 Tomb Raider was a phenomenon. It spawned more than ten sequels, spin-offs, and the eventual series reboot. If you are feeling nostalgic, and don't want to bother with emulators, you can now play the game that started it all, in your browser. Arguably a better browser game choice than Candy Crush, or any FB games. 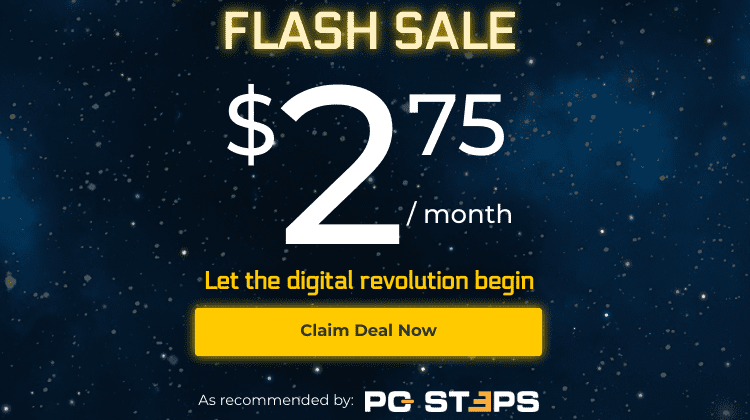 Can playing Tomb Raider affect my browser? Have you enjoyed Tomb Raider in the browser? You can just visit http://xproger.info/projects/OpenLara/ and play the second level, City of Vilcabamba. Warning, the game audio plays automatically when visiting the page, so if you are at work, turn your speakers down. Below the game window, you will find all the necessary controls and functions. If you want to know how this browser port came to be, and how to play every single Tomb Raider level in your browser, keep reading. Quick history recap: CORE Design was the original developer of the 1996 Tomb Raider. It was a British video game developer that had been around since 1988. 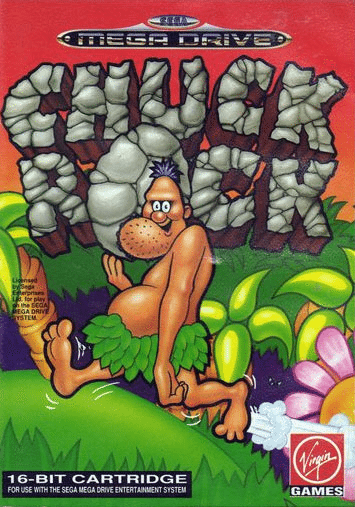 They had also created the Chuck Rock and Rick Dangerous franchises, among tens of other lesser-known titles. It's clear that Tomb Raider had been their goose with the golden eggs. And the eggs kept on coming... until 2003 and the dreadful Angel of Darkness, which ended up to be the slaughtering of the goose. With a Metacritic score of 52 and a user score of 6.3, the sixth Tomb Raider game is one of the worst games in the franchise. Furthermore, it single-handedly destroyed CORE Design. After this failure, key members of the CORE Design team left to establish a development company of their own, Circle Studio. 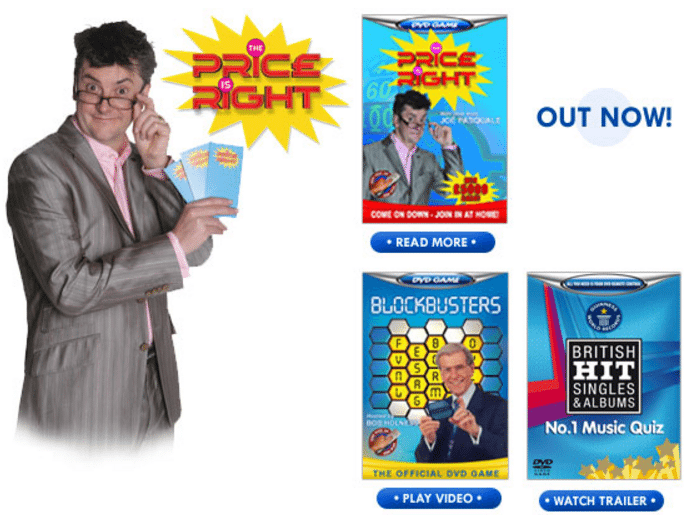 This company closed down by 2007, after producing a handful of what they called "DVD / iDVD games." If they gave them away for free, the price might have been right, indeed. Rebellion Developments, an independent studio, acquired the rest of the CORE Design's assets and staff in 2006. Eidos Interactive, the company that owned CORE Design, retained the CORE brand and intellectual property, including Tomb Raider. They put Crystal Dynamics, another studio that they owned, in charge of the franchise development. 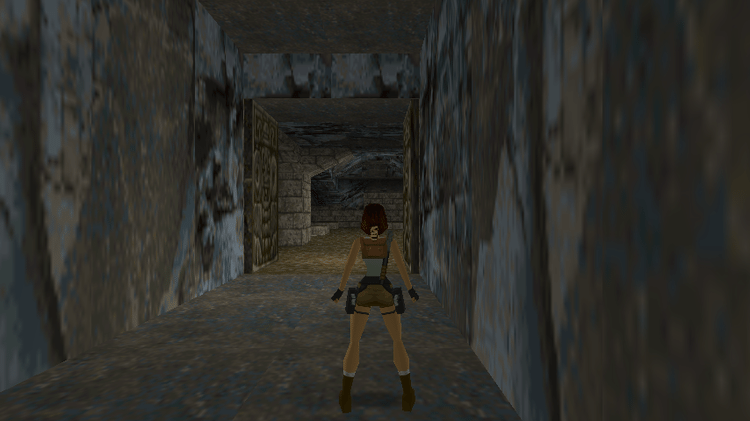 With CORE Design defunct and Crystal Dynamics developing an entirely new game engine for the latest Tomb Raider titles, a group of developers petitioned Eidos for the original game engine of Tomb Raider 1-5. However, after multiple petitions, "all attempts to retrieve sources from Eidos / Core were in vain." So, the developers decided to recreate everything from scratch. At first, the project changes a few names: TRE, tr1_engine, and TeslaRus engine. But is currently known as OpenTomb. 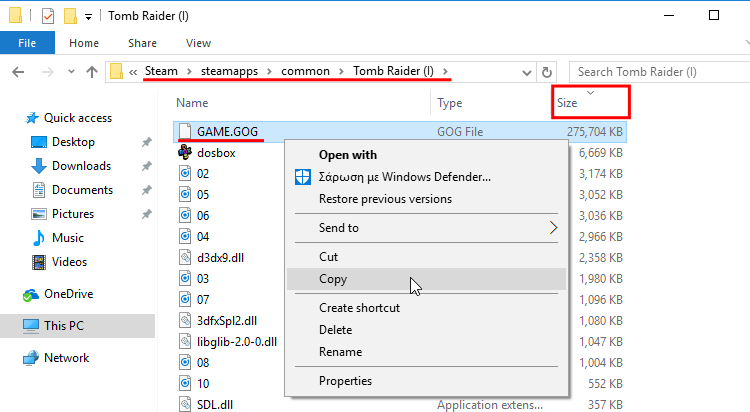 There are some other projects, such as Tomb Raider Next Generation (TRNG) and Tomb Raider Engine Patcher (TREP) which patch the original game engine for use with custom levels and new features. However, these projects work on a 15-year old binary, with outdated graphics and sound, no modern hardware support, and other significant restrictions. The developers behind OpenTomb have created a new game engine from the ground up. 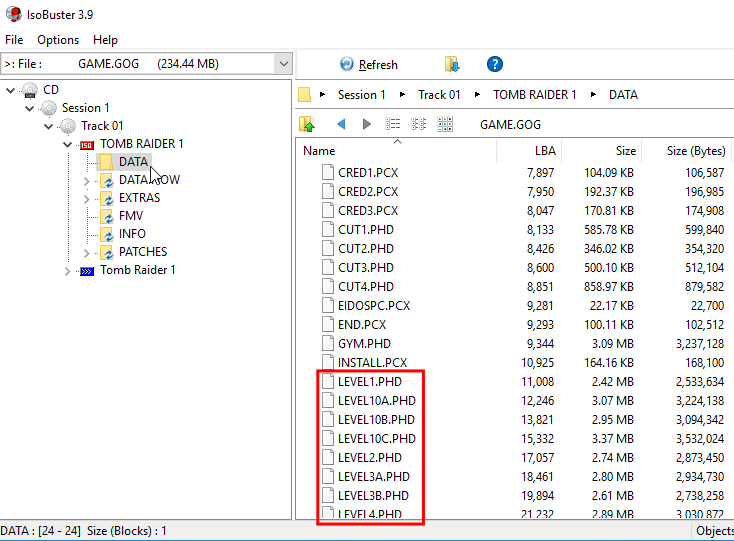 It is currently possible to load the game resources from the first five Tomb Raider games and play on any modern PC, but the whole project has a distinct "Alpha version" feeling. For more information about OpenTomb, you can check the Tombraiderforums. 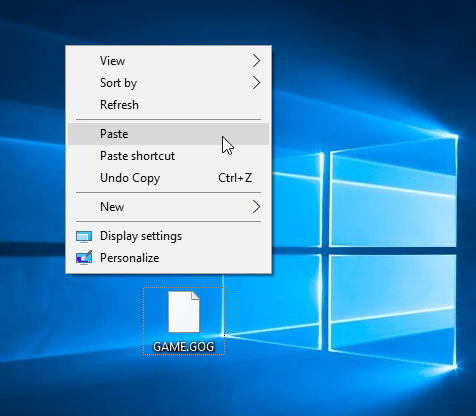 A significant advantage of the open-source OpenTomb game engine is that developers can port it to any system. Including our browsers. 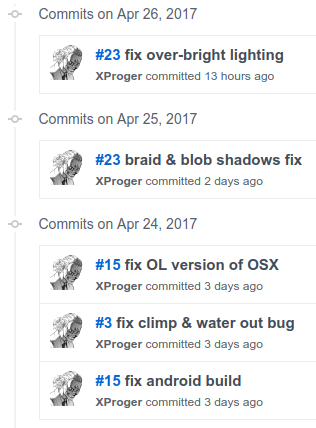 The Russian developer Тимур Гагиев (Timur Gagiev, according to Google Translate), known as XProger on GitHub, found the OpenTomb Project inspiring. 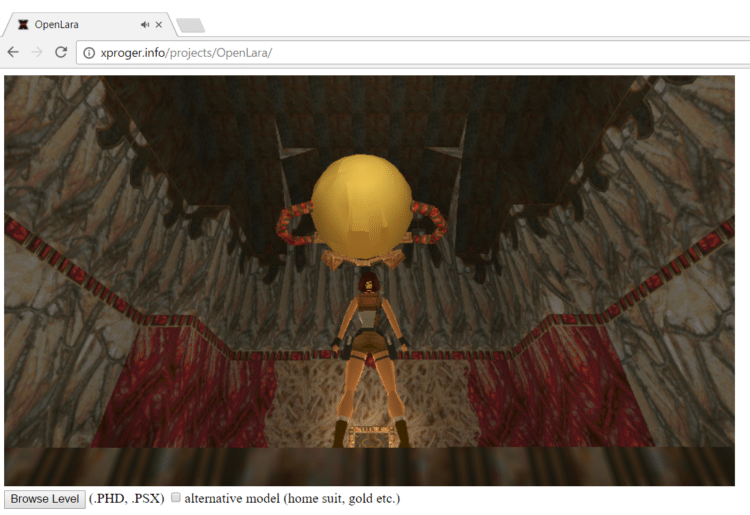 He proceeded to create a WebGL build that can run in a browser, which he calls OpenLara. 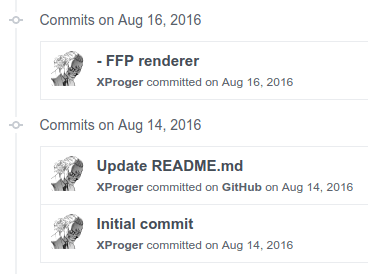 Following the GitHub commits for the project, we see that XProger made the first commit on August 14th, 2016. It's not clear how much of the already developed OpenTomb source he used, if any. But he has given much of his personal time to this project. XProger as been working on OpenLara for a solid eight months, as of this writing. Furthermore, he has fixed multiple bugs in the past few days, for different systems. 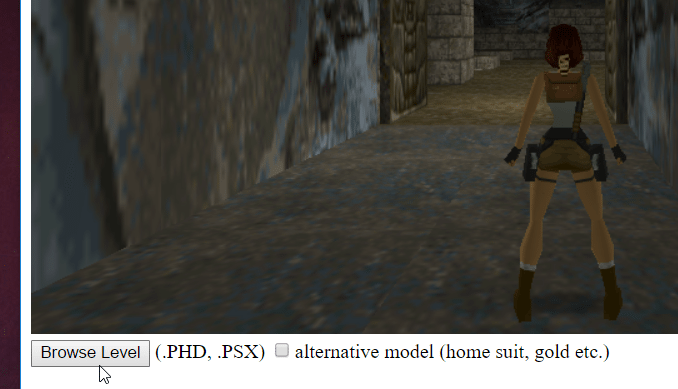 Most noteworthy, he added the option for us to load additional Tomb Raider levels, as .PHD or .PSX files. As we mentioned earlier, the browser version of Tomb Raider allows us to load levels different than the default City of Vilcabamba. We only need the .phd files for each level. To do this, we must own the original Tomb Raider, in any form. 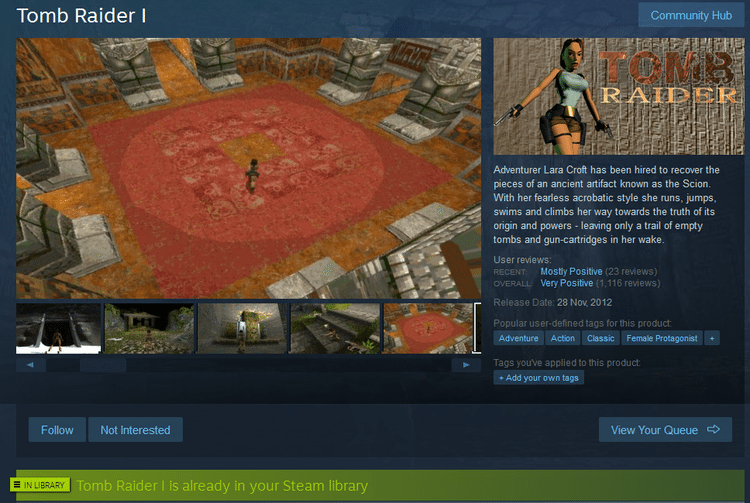 In our case, we already owned Tomb Raider (I) on Steam. But even the original CD-ROM version should work, for those who have it. After buying the game, we just have to install it. It's a 220MB download. With any decent internet connection, it should download within a couple of minutes, at most. 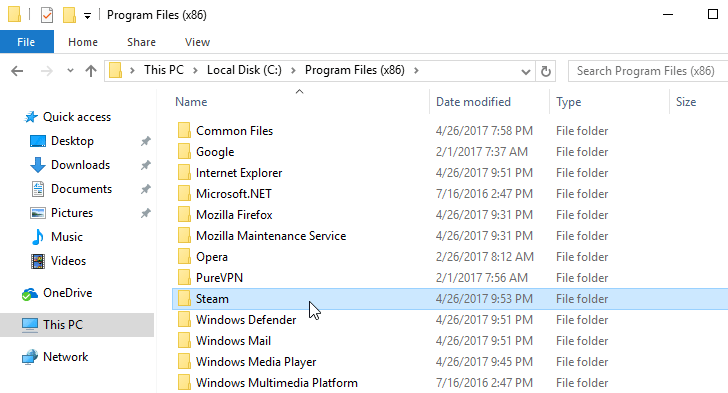 After the download ends, we navigate to our Steam folder. For most users with 64bit Windows, the default path is C:\Program Files(x86)\Steam. From the Steam folder, we navigate to steamapps-> common -> Tomb Raider (I). We sort the files by size and copy the largest file GAME.GOG. We paste a copy of the file anywhere. The desktop is fine. We will need an ISO-reading app to open this .GOG file. 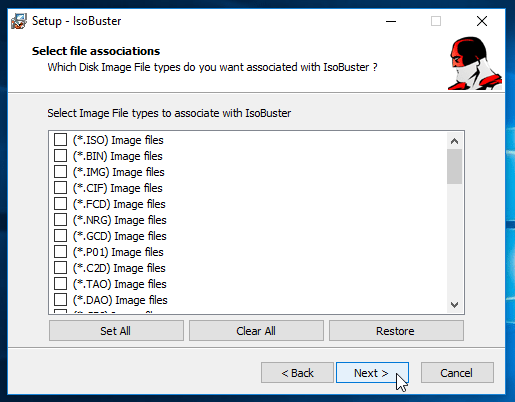 The free version of IsoBuster is a decent choice. 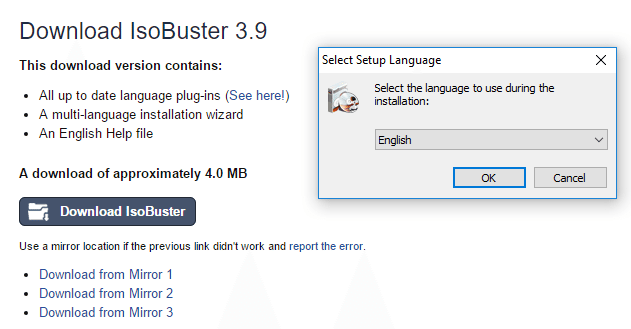 IsoBuster won't try to trick us into installing any unwanted third-party apps. It won't even attempt to highjack any relevant file associations. After the installation, we run the app and select "Free funct. only". 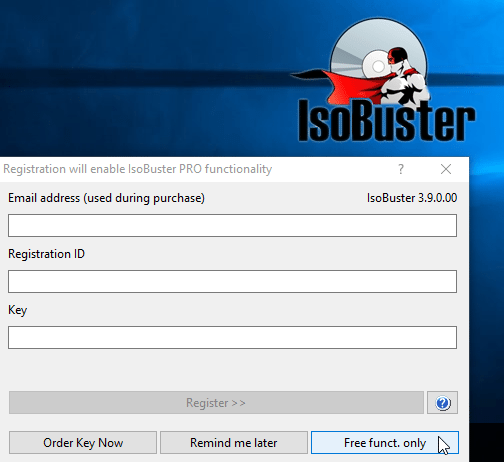 Finally, we drag and drop GAME.GOG anywhere on the IsoBuster interface. 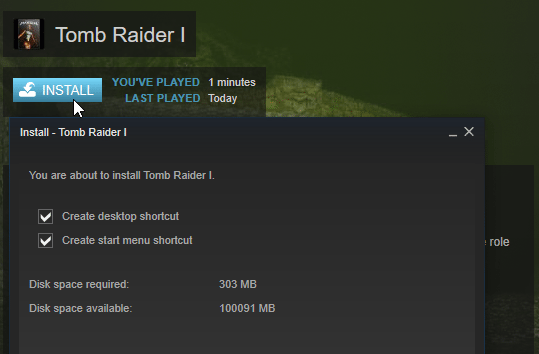 This will load all the original Tomb Raider files. We just need to navigate to the DATA folder, and we will find every level as a PHD file. 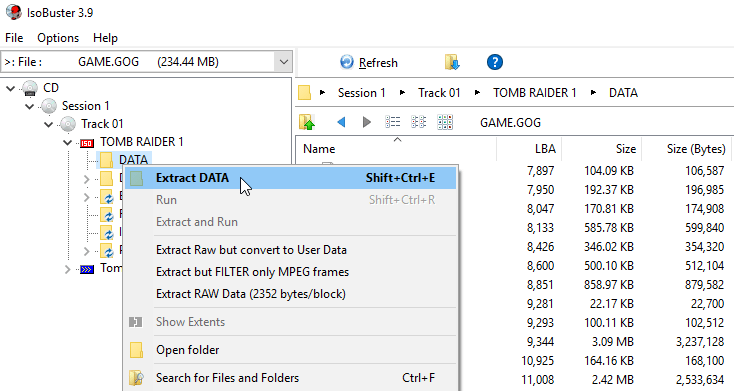 To extract all of the levels, we can right-click the DATA folder, and select "Extract DATA." 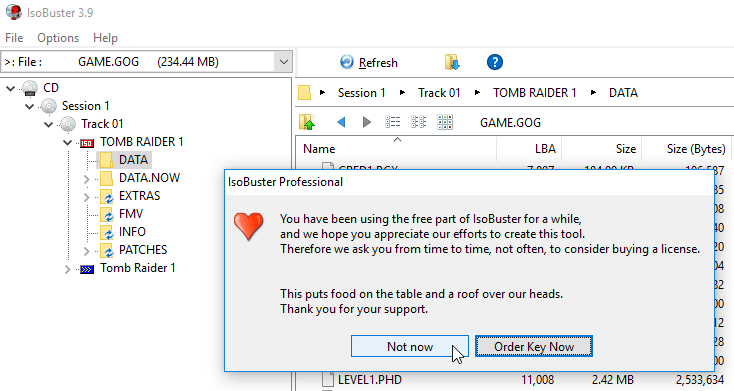 IsoBuster will politely ask us to buy it. We can politely ignore it with "Not now." 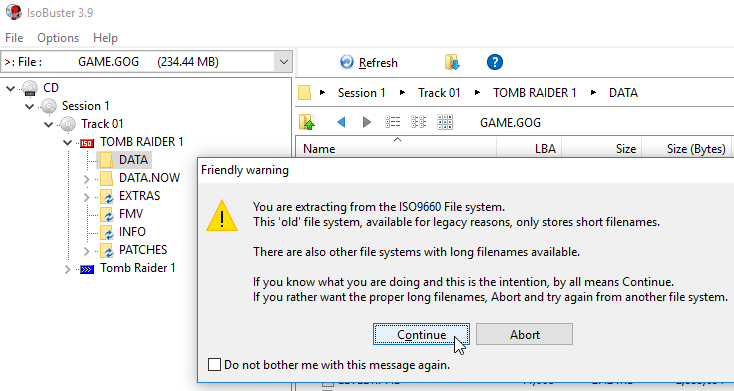 We will also get a warning about the ISO9660 File system, which is of no consequence in this operation. Click on "Continue." Finally, we select where to extract the DATA folder. The desktop is as good a place as any. ...navigate to the DATA folder on the desktop and finally select any level we want. Now we can play any level of Tomb Raider, on glorious widescreen and with uncapped FPS instead of the awful 4:3 30FPS DOSbox experience of the Steam version. Of course, not every level is guaranteed to work correctly, since the creator presumably hasn't fully tested them all yet. But even if we can't finish a level, we can always load the next one. 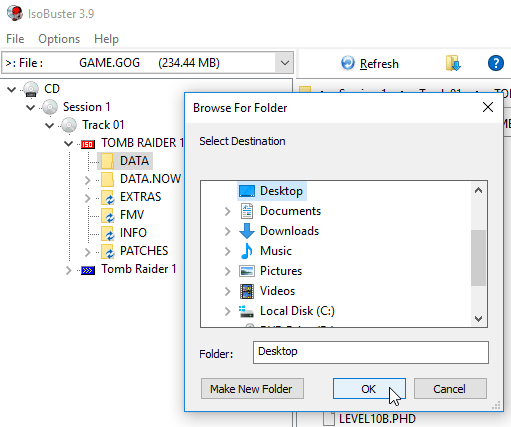 Your browser shouldn't be affected in any way, no matter how much Tomb Raider you have played. If, however, you are having any adverse effects, you can always reset your browser back to health. If you liked XProger's work and enjoyed playing Tomb Raider on your browser, or even if you thought that it sucked, leave us a comment. Previous Post: « What is the Real RAM speed and Should I get The Most MHz?